Before they even went on sale, proof and uncirculated 2009 American Eagle Silver Coins are temporarily suspended, according to a new United States Mint statement at its online store. The highly popular silver dollars are minted specifically for collectors, bearing the "W" mintmark to denote their striking at the Mint’s West Point facility. 2009 coins are on hold for the same reasons sales of American Eagle Silver proof coins were canceled early in 2008 — "unprecedented demand" and the Mint’s need to focus on bullion versions of the coin, which bear the same design, but do not have the "W" mintmark. These bullion versions are intended for investors, although coin collectors buy them as well. By law, the Mint is required to produce bullion versions in sufficient quantities to meet public demand. The collector proof and uncirculated versions, therefore, take a back seat when the Mint’s silver blank inventory is low or depleted. Blazing hot Lincoln Silver Dollar sales likely account for snapping up a portion of the inventory normally used for silver eagles. Production of United States Mint American Eagle Silver Proof and Uncirculated Coins has been temporarily suspended because of unprecedented demand for American Eagle Silver Bullion Coins. Currently, all available silver bullion blanks are being allocated to the American Eagle Silver Bullion Coin Program, as the United States Mint is required by Public Law 99-61 to produce these coins "in quantities sufficient to meet public demand . . . ."
The United States Mint will resume the American Eagle Silver Proof and Uncirculated Coin Programs once sufficient inventories of silver bullion blanks can be acquired to meet market demand for all three American Eagle Silver Coin products. 2008-W uncirculated American Silver Eagles coins are still available from the Mint as part of the Annual Uncirculated Dollar Coin Set for $37.95. 713,353 of the 2008 proof versions were sold, according to the latest Mint sales figures. Their value in the secondary market has climbed substantially. While the Mint sold them for $31.95, current eBay auctions for example have non graded versions listed for just below $90. 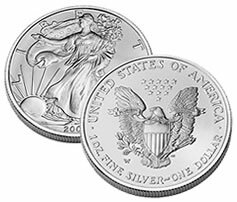 When will the 2009 American Eagle Silver Proofs be available again? I have been collecting them since the program started – 1986. I am in hopes that the 2009 Silver Eagle Proof is not skipped and then resumed in 2010. This coin represents our country and should not be skipped or eliminated. I have all since 1986 and would sure hate to miss a year. Hope it comes back in 2009. Good plan to eliminate other coins that eat up the silver blanks. if they make proof and w mint silver eagles there will be an small amount made so get as many as you can. Well the US Mint decided to take the easy way out and not produce the AE proofs this year. If your a collector you need to get in touch with your Congressman like I did and let them know about this stupid decision. Fot the last 3 months the US Mint Reps have been saying they will be produced, yeh sure. Today when I talked to the Mint Rep. she said I could write customer service and express my displeasure. Oh yeh, that will do a lot of good. The Mint Director is totally isolated and probably thinks this was an okay decision. Shame on the Mint that they’re not able to multi-task. Absolutely pitiful as far as I’m concerned. So sad! The proof American Eagle coins must continue, stop making all the so called “specials” that are eating up blanks for a more deserving collectable coin! Well I quit collecting the proofs after “Edmund C. Moy” and company decided they couldn’t manage making a proof American Eagle in 2009. What a travesty put on collectors. Now the clown is signing recent certified American Eagles as a past mint director. Wow, color me as unimpressed. He’ll always be remembered as the Mint director that put a void in the American Eagle proofs. I wouldn’t give a nickel for anything with his name on it.